A 26-year-old previously healthy man presented to the emergency department with rapidly progressing upper and lower extremity weakness that developed following episodes of pain and tingling. Initial laboratory work-up was unremarkable with lumbar puncture results pending. Physical examination demonstrated marked diffuse weakness with decreased sensation to fine touch in the lower extremities and bilateral C7 and C8 dermatomes; proprioception was intact. The patient had a T1 sensory level to pin prick with preserved deep tendon reflexes. MRI of the cervical spine was performed for further evaluation (Figure 1). Patients presenting with gradual or sudden onset of limb weakness or sensory disruption need a careful physical examination to predict lesion level. Differentiation of loss of pain, touch, and proprioception is critical in localizing the lesion, as the spinothalamic tracts decussate immediately upon entering the spinal cord (pain and touch); however, the dorsal columns do not decussate until the medulla within the lemniscal decussation (proprioception). Thus, the finding of loss of pain and touch with preservation of ipsilateral proprioception would localize a lesion to the spinal cord. Imaging of the spinal cord can be challenging, as the finding of T2 hyperintensity within the cord is a nonspecific finding that demands further work-up and clinical correlation to determine an exact etiology. Imaging findings to report and that are helpful in narrowing an otherwise broad differential diagnosis include: location and extent of signal abnormality, presence or absence of cord expansion, and presence or absence of enhancement. An additional role of imaging includes ruling out a compressive lesion that may be responsible for the patient’s symptomatology. Intramedullary tumors, though relatively uncommon, can present as infiltrating or focal regions of T2 hyperintensity, with a propensity for the cervical cord. A diagnostic clue, when present, is cord expansion. Ependymomas are more common than astrocytomas overall, and particularly within the adult population, while astrocytomas are more common in the pediatric population. Ependymomas tend to be more heterogeneous and prone to intralesional hemorrhage with a characteristic hemosiderin cap. Peritumoral edema and tumoral cysts or an adjacent syrinx may be seen. While these tumors tend to be lower grade, there can be foci of enhancement, which are important to describe to direct biopsy, when necessary. Tumor grade at diagnosis is the most important prognostic variable.1,2 Treatment is often multimodality with a combination of surgery, radiation therapy, and/or chemotherapy, depending on tumor histopathology. While most patients with multiple sclerosis (MS) will present with synchronous or metachronous intracranial findings, up to 20% of patients can present with isolated spinal disease.3 Over the course of the disease process, more than half of patients with MS will develop spinal lesions. Of those who do, the majority of lesions (up to two-thirds) will be in the cervical cord.3 Demyelinating lesions of MS often occur in the dorsolateral cord, span typically less than half the cross-sectional diameter of the cord, and are < 2 vertebral bodies in length. The lesions do not, however, respect the gray-white matter junction in the cord. Lesions are T2 hyperintense and may demonstrate enhancement or diffusion restriction in the acute phase of demyelination; enhancement may persist for up to 2 months. Chronic demyelination often leads to cord atrophy. In terms of demographics, MS is more common in women and often presents in the third to fifth decades of life. Lumbar puncture may be helpful in establishing the diagnosis, as oligoclonal bands are found in more than 80% of patients.4 Prognosis is directly related to the MS subtype: primary progressive, progressive relapsing, relapsing remitting, and secondary progressive. As with brain infarctions, the clinical presentation of spinal cord infarctions is heralded by the acute onset of symptoms. Anterior spinal cord infarctions are more common than posterior given the paired posterior spinal arteries. Infarctions demonstrate restricted diffusion in the acute phase, but often will not enhance until the subacute phase (7-10 days). The finding of associated vertebral body infarction can be a helpful diagnostic clue, as both the contributors to the anterior spinal artery and the artery to the vertebral body arise from radiculomedullary branches.8 There is no gender predilection for infarctions, but patients are often older (in their sixth decade or greater) and may have a predisposing history of atherosclerosis. The severity of symptoms at onset may be predictive of eventual functional outcome. MRI is an important imaging tool in the evaluation of patients with neurological symptoms, especially when symptoms are acute, persistent or progressive. Although the imaging appearance of many pathologic entities overlap, correlative clinical information and secondary imaging findings can often help narrow the list of differential considerations. 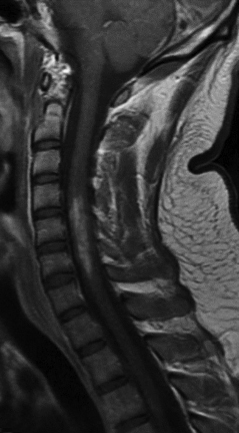 Therefore, it is important for radiologists to have a working knowledge of the clinical and imaging manifestations of a variety of pathologic conditions when interpreting spine imaging. Fakhreddine MH, Mahajan A, Penas-Prado M, et al. Treatment, prognostic factors, and outcomes in spinal cord astrocytomas. Neuro Oncol 2013:15(4);406-412. Ahmed R, Menezes AH, Awe OO, et al. Long-term disease and neuorological outcomes in patients with pediatric intramedullary spinal cord tumors. J Neurosurg Pediatr 2014:13;600-612. 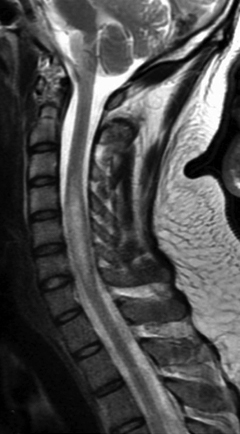 Grossman RI, Barkhof F, Filippi M. Assessment of spinal cord damage in MS using MRI. J Neurol Sci 2000:172 Suppl 1;S36-S39. Bergamaschi R, Tonietti S, Franciotta D, et al. Oligoclonal bands in Devic’s neuromyelitis optica and multiple sclerosis: differences in repeated cerebrospinal fluid examinations. Mult Scler 2004:10(1);2-4. Sheerin F, Collison K, Quaghebeur G. Magnetic resonance imaging of acute intramedullary myelopathy: radiological differential diagnosis for the on-call radiologist. Clin Radiol 2009:64(1);84-89. Goh C, Desmond PM, Phal PM. 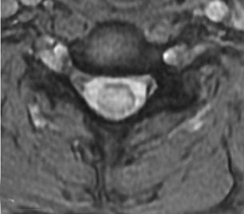 MRI in transverse myelitis. J Magn Reson Imaging 2014:40;1267-1279. Borchers AT, Gershwin E. Transverse myelitis. Autoimmun Rev 2012:11;231-248. Cheng MY, Lyu RK, Chang YJ, et al. Concomitant spinal cord and vertebral body infarction is highly associated with aortic pathology: a clinical and magnetic resonance imaging study. J Neurol 2009:256;1418-1426. Arslan F, Yilmaz M, Paksoy Y et al. 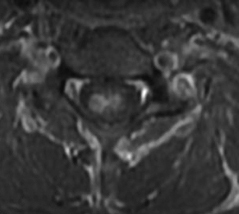 Cytomegalovirus-associated transverse myelitis: a review of nine well-documented cases. Infect Dis 2015:47;7-12. Irani DN. Aseptic meningitis and viral myelitis. Neurol Clin 2008:26;635-655. Grayev A . Spinal Cord Signal Abnormality with Enhancement. J Am Osteopath Coll Radiol. 2015;4(4):20-22. Dr. Grayev is with the Department of Radiology, University of Wisconsin School of Medicine and Public Health, Madison, WI.